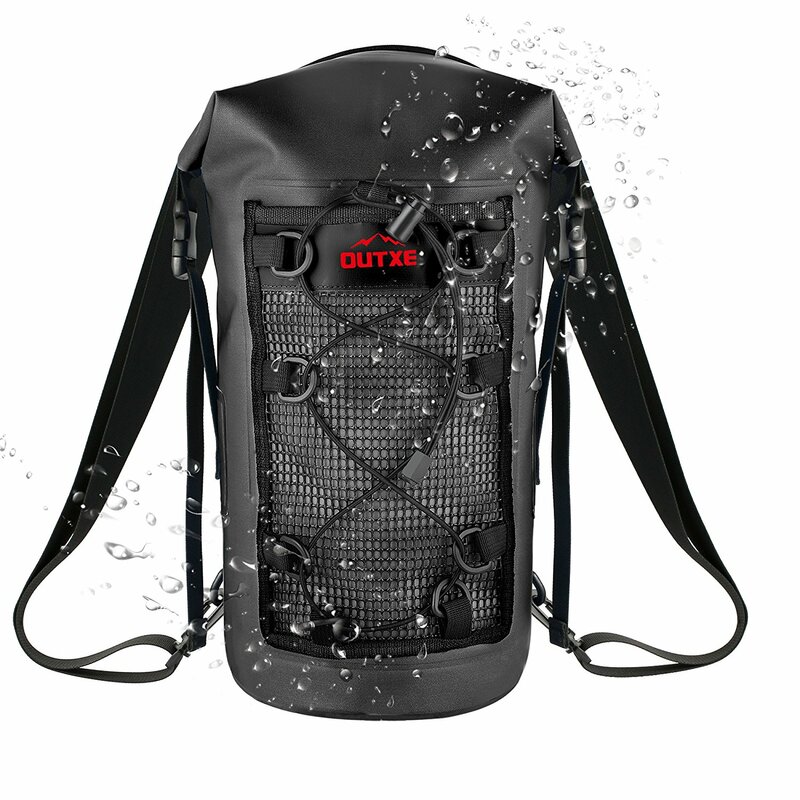 In this review, we’ve been testing the OUTXE 10 Litre Dry Bag Backpack, and we have to say we love this product! OUTXE provided a complimentary backpack for our review, but did not provide compensation or exercise control over the content of this post, so we’re reporting on our findings from various tests as we put the bag through it’s paces! This OUTXE dry bag is made from a tough and abrasion-resistant TPU, an eco friendly material that’s lighter than PVC and less stiff, so it’s more comfortable to use and carry. Although reasonably lightweight, it’s durable enough to withstand extreme environments , so there are no worries with this bag standing up to some serious use. In our tests, the material seems very durable and tough. If you’ve used dry bags before, you may be familiar with the traditional fastening methods at the top of roll-top bags, however OUTXE have gone one step further and introduced a ziplock seal and velcro strip that adds further security and excellent levels of waterproofing. The manufacturers claim this bag can be submersed as long as it is properly closed and we found this to be the case in out tests. An added benefit, is that air can be trapped in the bag, making it a useful buoyancy aid in water. There are removable shoulder straps included with the bag which can be un-clipped, or used in various configurations to fasten the bag kayaks, etc, and we found these to be pretty decent when used in a backpack format, and seemed very strong and robust. The straps have no padding, so if you’re carrying anything heavy this could be a minor issue, but we had no problems in our test use. The clips are secure and well attached to the straps, and the length can be adjusted to suit the use. A nice feature that we found very useful was the front mesh pocket, which was a handy size and gave quick access to items. Although the bag is claimed to be 10L, you can extend this slightly if you roll the top a few less times, and we found the capacity more than adequate for a day of activities, where you may want to carry some food, extra clothing and some electronic devices. This bag is not intended to replace a traditional backpack for hiking etc, although it can certainly be used that way. For watersports or activities where wet conditions are likely and you need to protect what you’re carrying from moisture, it’s a fantastic option and worth having in your kit list. Overall, we highly recommend this bag. It’s a simple design and versatile enough to use for a wide range of activities from kayaking, beach trips to mountain biking in wet and muddy conditions. For the price it’s great value and should last for many years of adventures.